Soak Up the Sun Beneath a Luxury Glass Canopy this Summer! Today’s guest post from 123v looks at their practical and stylish glass canopies, great for making the most of your garden and outdoor space. A bespoke glass canopy structure adds a stylish accent to a home’s patio area, maximising a property’s outdoor space across all seasons. This summer, with the promise of bright, sunny days, enjoy more of your garden with a customised domestic canopy or bespoke veranda installation. 123v glass canopies are designed on the basis of two fundamental principles: style and substance. Each configuration is tailored to individual specifications, enabling homeowners to fully influence the development of their garden canopy project. What are the advantages of summertime shelter in your own garden? A secluded slice of outdoor enjoyment. An ornate glass canopy creates a peaceful, secure shelter beneath which to relax and appreciate the passage of nature. Given the installations are open-sided, entry to your garden from your canopy is unrestricted when you wish to explore. It is possible to breathe in the fresh air, absorb the delights of your back garden and experience the best of British summer. The unpredictable manner of British weather means we are often exposed to interruption from a sudden rain shower. A custom-built glass canopy, fixed to a building’s structure, overhangs across patio decking and garden space to shield chairs, tables and guests. Dine out at home and enjoy an undisturbed evening meal as the late summer sun begins to set. An outside patch can be furnished with style, protected from unwelcome weather. Materials in construction should be robust and weather resistant, able to withstand strong gusts, heavy snowfall and extreme rainfall. 123v’s industry experience is demonstrated in the sturdy form of their constructions. 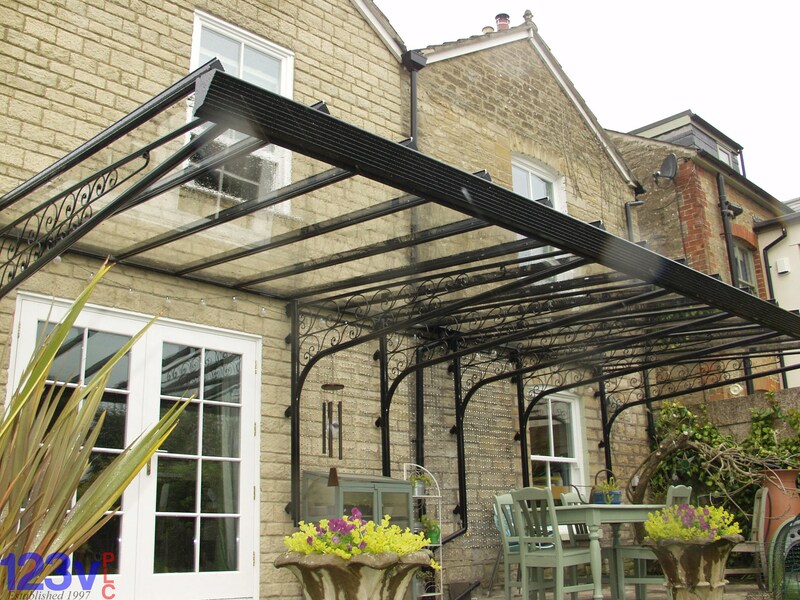 Brighten up your garden with summer sleek glass canopy. To transform your patio into a tranquil garden scene get in touch with 123v, the UK’s leading designer-installer of carports, canopies and verandas.